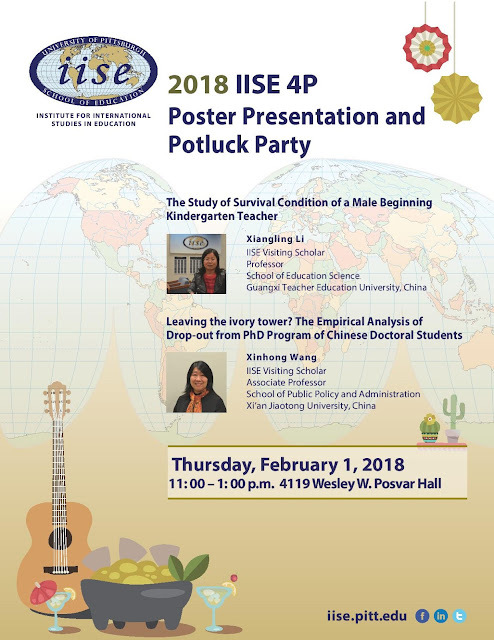 PennsylvAsia: Poster presentation with visiting Chinese scholars at the Institute for International Studies in Education, February 1 at Pitt. Poster presentation with visiting Chinese scholars at the Institute for International Studies in Education, February 1 at Pitt. The University of Pittsburgh's Institute for International Studies in Education will host a poster presentation featuring two visiting scholars from China on February 1. The event runs from 11:00 am to 1:00 pm in 4119 Posvar Hall (map) and is free and open to the public.